The Ghost Connector is a companion functionality to Sub-Assemblies. An example is to have a standalone "real" connector and insert a predefined sub-assembly, that contains one special connector called "ghost", it is displayed, but greyed out. 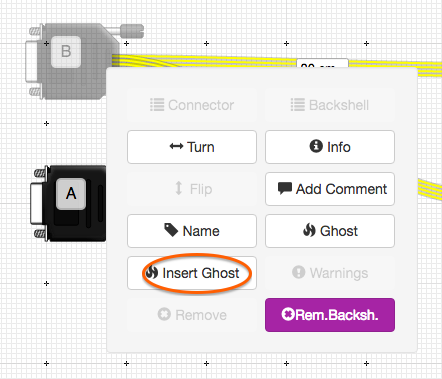 The "ghost" connector is created by a click on the connector options and selecting "Ghost". The B connector is the "ghost", the A connector the real one. If the real connector A will be clicked, it will merge both, to one connector location. The "ghost" connector has been disappeared, but all its dependencies (pinout, grounding etc.) are now moved on the "real" connector with the letter A.